Today’s post is a blatant promotion for my lovely friend Alison and her newly published novel! One of the things that goes on behind the scenes of novel writing is ‘Beta-reading.’ This is where you get a writer whose work you admire to read all or part of your work in progress and ask them for specific and honest critique of what you’ve written. These trusted souls are worth their weight in gold, and Alison, who I met via Twitter, was one of the lovely people who took the time and care to read part of an early draft of The Night Rainbow and tell me her thoughts. In the same spirit I’ve also read extracts from her work, including her brilliant novel Housewife with a Half-Life. When I read it, it made me think immediately of Douglas Adams’ Hitchhikers books. It’s funny, it’s bizarre…in fact it’s a space romp. Can I call it that, A? Alison is a superb writer, and has now developed a split personality, keeping her more literary (in genre terms) fiction under her own name, whilst her science-fictiony self is now going by the name of A.B. Wells. She has decided to self-publish this novel, and the paperback will be out in June. Meanwhile for ebook readers, you can find links below and read it right now! Susan Strong is a suburban housewife who is literally disintegrating. When Fairly Dave, a kilt-sporting spaceman arrives through the shower head to warn her, she knows things are serious. When she and her precocious four year old twins, Pluto and Rufus, get sucked through Chilled Foods into another universe it gets even messier. Where household appliances are alive and dangerous, Geezers have Entropy Hoovers and the Spinner’s Cataclysmic convertor could rip reality apart, Susan Strong is all that’s holding the world together. In this lively space comedy, Susan and Fairly Dave travel alternate universes to find Susan’s many selves, dodge the Geezers and defeat evil memory bankers. From dystopian landscapes and chicken dinners, to Las Vegas and bubble universes, can Susan Strong reintegrate her bits and will it be enough to save us all? What is a housewife to do when she becomes 42? Write a book about life, the universe and everything. A.B.Wells is the mother of four children age 11 and under, three of whom are that particularly alien species called boys. As Alison Wells her more literary writing has been shortlisted in the prestigious Bridport, Fish and Hennessy Awards and she’s been published or is about to be in a wide variety of anthologies and e-zines, including the Higgs Boson Anthology by Year Zero, Metazen, The View from Here, Voices of Angels by Bridgehouse and National Flash Fiction day’s Jawbreakers. She recently one the fiction category of the Big Book of Hope ebook with a flash fiction medley and has a litfic novel The Book of Remembered Possibilities on submission. She blogs for writing.ie in the guest blog: Random Acts of Optimism. One of the as yet unsolved mysteries of the universe is whether the B in A. B. Wells stands for barmy or brilliant. In her former life she worked, among other things, as a clerk like Albert Einstein, as a technical writer (and a HR. Manager) and before that studied psychology and communications where, in the college library James Gleick’s book Chaos fell on her head. Her ambitions include a desire to travel to see the Northern Lights and to really travel with Dr Who’s David Tennant in a Tardis. 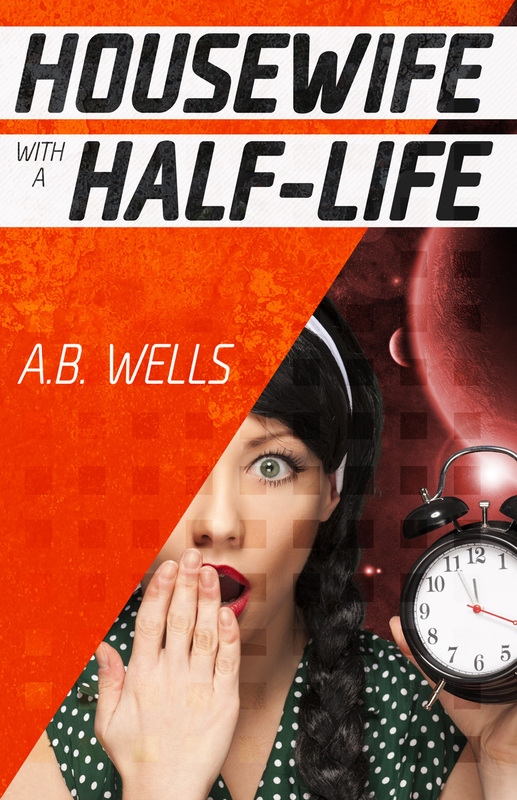 Download Housewife with a Half-Life…! In short, I clicked, I bought! Hurray! Thank you and happy reading! Ha! This sounds like a great read – time travel and chicken dinners and strangers speaking through the showerhead! Definitely my cup of tea. Thanks Clair, I hope you enjoy it (sure you will)!